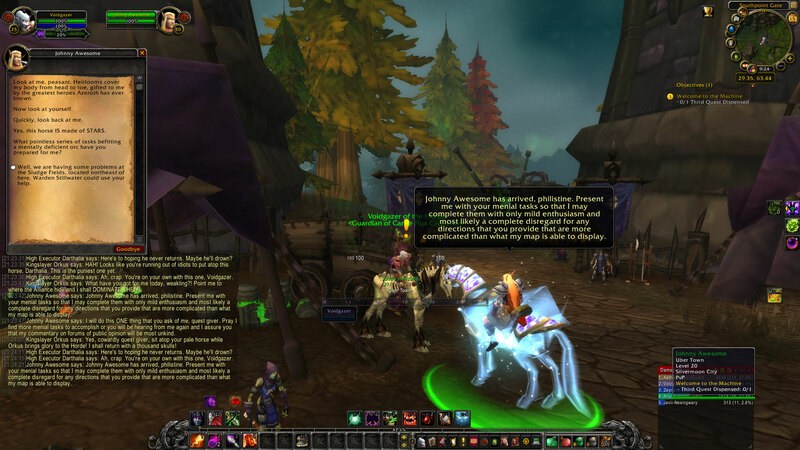 The last time I wrote about Voidgazer’s questing, I had just finished Silverpine Forest. That was months ago, and I got a lot further now. Note that I’ll be talking about my opinion of the zones in this post, so there will be spoilers for many Cataclysm low-level zones in Eastern Kingdoms. In Hillsbrad Foothills, I particularly liked the quest to be a quest giver myself. I sent Dumass napping because he wouldn’t be able to do much else. 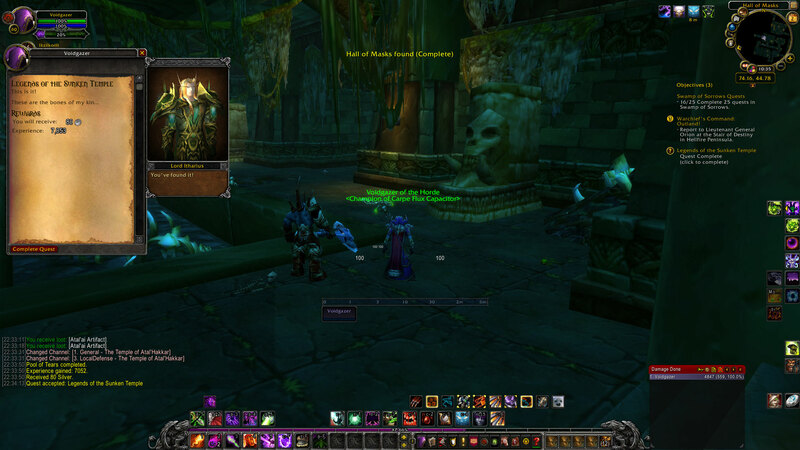 I sent the mighty Kingslayer Orkus to Southshore. He’s a great character. 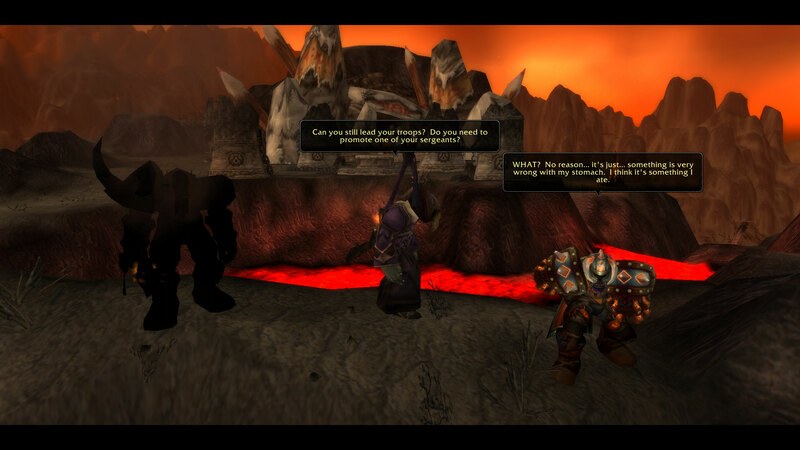 It’s too bad I didn’t do this quest at the beginning of Cataclysm instead of the end of Mists of Pandaria. Lastly, I sent Johnny Awesome, decked out in full heirlooms, to the Sludge Fields. These three characters really to represent three major cliches of character types. There’s the newbie, the high-level character who’s overly proud, and the alt who is really awesome (on his other toon). We also get to see Drek’Thar. I don’t remember seeing him in declining health in the game, but I might have missed his presence somewhere. I knew he was getting older and his health was slipping from the novels, but it’s always cool to see these things reflected in the game. I didn’t really feel like the Arathi Highlands were memorable. Similarly, I remember what happens in the Hinterlands but only because it’s annoying. It feels like you’re done with the enemy troll hub like five or six times. “Good job. You really cleared them all out of there! They’re all defeated! …Okay, now go back in there and…” The zone moved at a snail’s pace. Looking back on them now, the problem with these two zones might simply be that they come right after the excellent storytelling of the Forsaken-centered zones. I happily got back to the great zones when I was sent to Western Plaguelands. 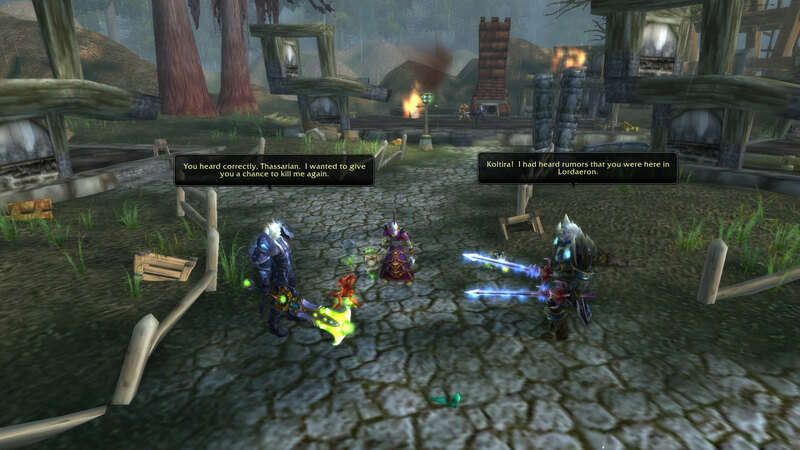 Koltira is a fascinating character with his interactions with Thassarian, his Alliance counterpart. Too bad Sylvanas doesn’t seem to like him as much as I do. I look forward to hearing his story unfold more in the future. 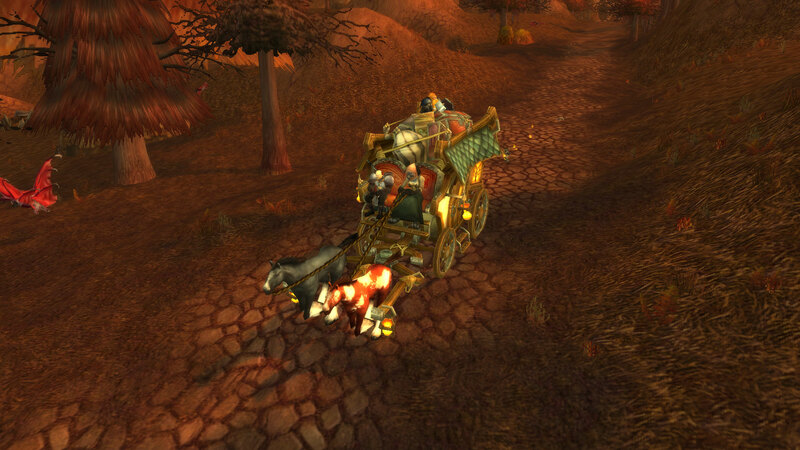 In the Eastern Plaguelands, you join a caravan that slowly moves through the zones as you progress in the quests. It’s actually similar to Vashj’ir, only fun. As you progress, more people join the caravan. While none of them made an impression in my mind deep enough to cause me to remember their names or specific details, it was fun to watch their interactions through the zone. There was a drop in quality when traveling to the Badlands although I still enjoyed it. 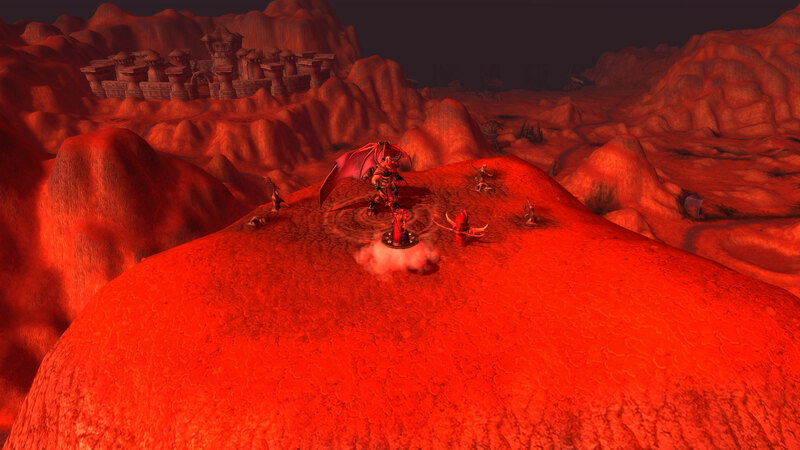 In this zone, players deal with attempts by the red dragonflight to save the black dragonflight. 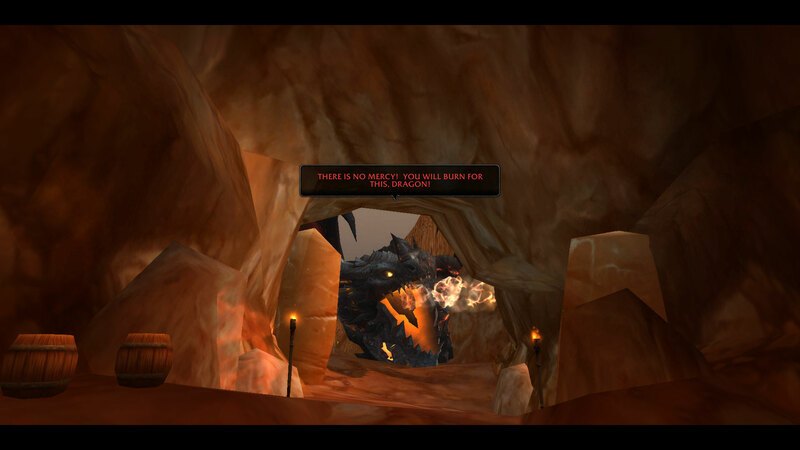 Deathwing doesn’t seem too happy. We also get to learn all about the day that Deathwing came and what really happened as a small group of friends tell stories and argues about who got it right. 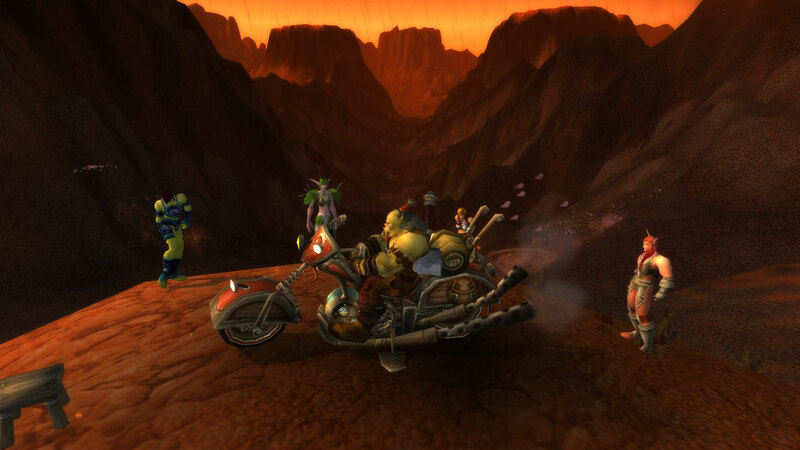 Martek the Exiled told me all about his flying motorcycle and the hot babe who rode with him. The Searing Gorge wasn’t as compelling as the Forsaken zones, but it had its moments. Lunk, the pacifist ogre, makes for some good comic-relief. It turns out you can be quite effective without killing – if you’re huge. The zone also contained the fun quests about stealing the pillows from the Dark Iron that I wrote about previously. By the time I reached the Burning Steppes, I was getting anxious to finish the content. 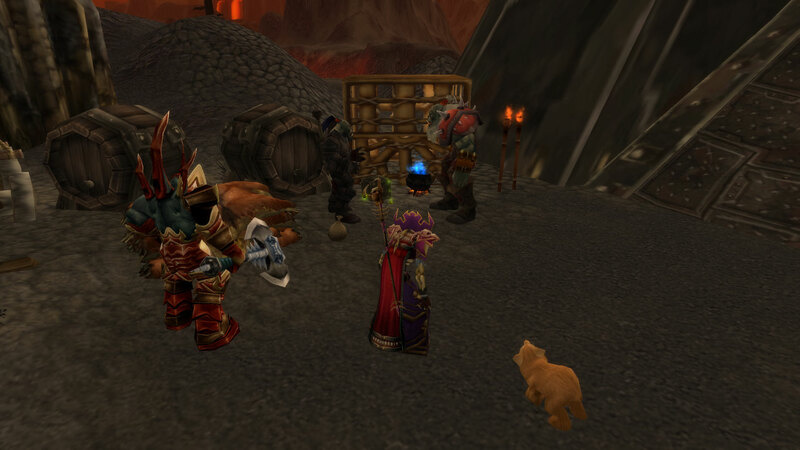 The zone deals with stopping the Blackrock Clan’s impending invasion of Redridge Mountains. I’m glad I did some questing on my Alliance character before reaching this zone because it gave me a bit of understanding of the Alliance’s struggle against the Blackrock orcs. It was nice to see Eitrigg and his son, Ariok, working to stop them. Screwing with the leaders of the orc clan was fun as well. The Swamp of Sorrows was a short zone that didn’t seem very eventful. However, this reference to Nickelodeon’s Legends of the Hidden Temple brought a quick smile to my face. Finally, I reached the Blasted Lands where I spent time completing quests of questionable ethics against the Alliance as well as fighting some demons. With everything concluded nicely, it’s time for Voidgazer to step through the Dark Portal to Outland! Or, it would be if I intended to play him more. For now, his story is finished. 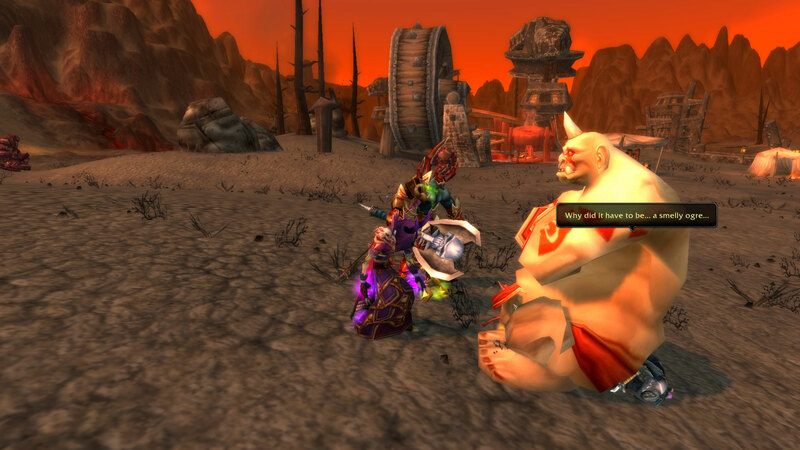 Today’s Breakfast Topic from WoW Insider was on memorable NPCs from Cataclysm. Anne Stickney begins her discussion with Mylune, the dryad from Hyjal. 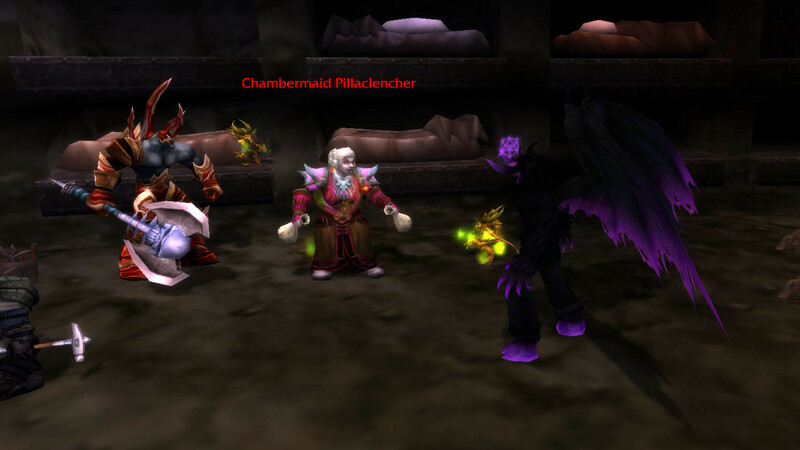 She ends with two questions; “Do you have a favorite NPC that was introduced with Cataclysm? Who stands out in your mind?” Well, I skipped a lot of quests from Vanilla and BC (and a couple zones from Wrath), so I’ll pretend that NPCs I didn’t know about previously count. First, I completely agree with the choice of Mylune. She’s so cute. Devee would totally love to hook up with her. Read the quest text from these two quests. Don’t you want to cuddle her? Speaking of things I want to cuddle (and Hyjal), I love the bear cubs you save. Do they count as NPCs? No?! Well… um… then I also love Tortolla, the giant turtle that you get to hang out with in Hyjal. I also like Erunak Stonespeaker. I’ll admit, it’s not really because of him. What I love is the way he progresses with you as you play through Vashj’ir. Very cool. It made the zone feel much more alive. There’s one final NPC that I have to mention, and he’s also from Vashj’ir. Thrall’s balls is he a good one! 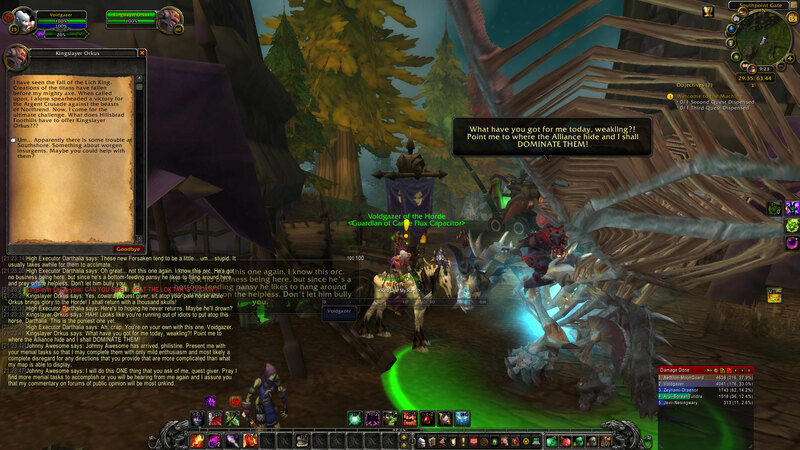 Of course, I’m talking about Legionnaire Nazgrim. Hey! 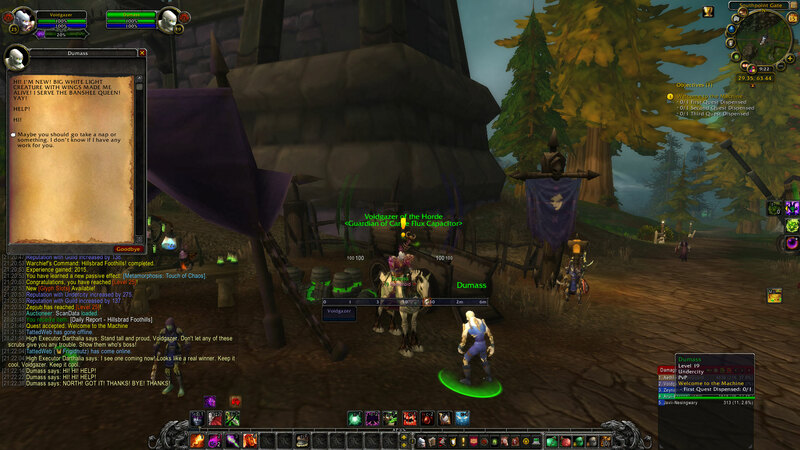 Technically Legionnaire Nazgrim was introduced in Cataclysm.